Thursday night was big a big one as the Rotary Club of Jasper gathered together to present the 7th Annual ATHENA International Leadership Award! Hundreds of locals poured into the round tables at the Huntingburg Events Center in suspense of this year’s recipient. The winner was chosen from a pool of 5 finalists, including Kim Lottes, Beth Seidl, Kim Messmer, Marie Patton, and Sandy Smith. All honorees were recognized as possessing qualities of a successful leader in the 21st Century. The winner of the 2018 ATHENA International Award was Kim Messmer. Messmer is the Independent Future Executive Senior Sales Director for Mary Kay Cosmetics and chose the Crisis Connection to receive a portion of the evening’s proceeds from the event. Messmer recalled her emotions when she was first announced as the award winner. Messmer further said that receiving the award was a humbling moment. 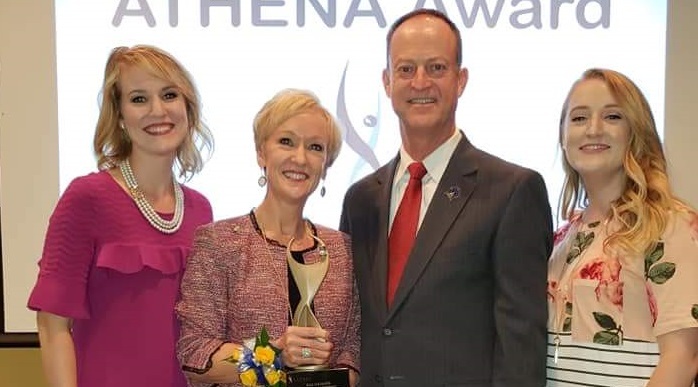 The award focuses on an individual’s traits within the ATHENA Leadership Model, including Authentic Self, Giving Back, Relationships, Collaboration, Learning, Courageous Acts, Fierce Advocacy and Celebration and Joy—along with traditional leadership pillars such as taking risks, assertiveness, and hard work. Messmer had this advice for young women aspiring to become entrepreneurs. Susan Elkington, who has lived in Huntingburg most her life and recently was named plant president of Toyota’s Georgetown, Kentucky plant and one of only three women who will oversee a Toyota production plant in the United States– was last night’s keynote speaker. ATHENA International is a non profit organization founded in 1982; that seeks to support, develop, and honor women leaders. Be the first to comment on "KIM MESSMER NAMED RECIPIENT OF 2018 ATHENA INTERNATIONAL AWARD"